Chaney refused to act in talkies, he was an actor solely given to the silent era. He was highly skilled in mime no doubt from an early age as both his parents were deaf, so non verbal communication based on facial expression and movement had been his whole life.Verbal communciation in astrology is ruled by the Air element and by Mercury. 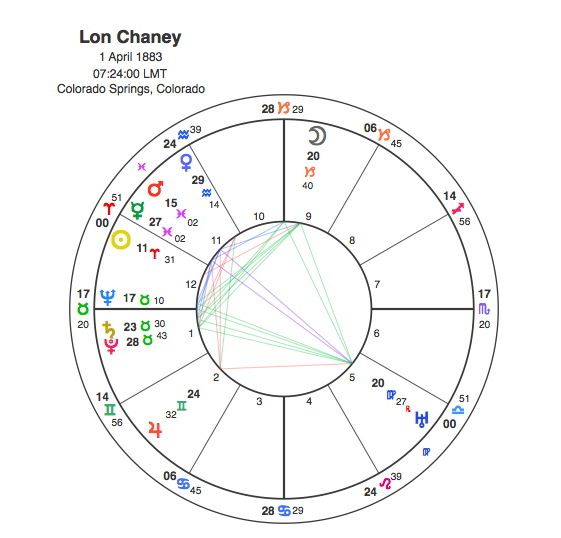 Chaney had very little Air in his chart but had a Grand Trine in the practical Earth which incorporated 5 planets including his Moon and Ascendant. Earth is the element of physicality so he had tremendous natural skills in movement and physical expression. He was a highly skilled dancer.The Grand Trine is a gift from the gods but the only potential downside of this aspect pattern is that it can make people lazy and not use their talents fully because they learn to expect everything to come to them easily with little effort on their part. The Kite formation changes this expression of the Grand Trine. A Kite is formed if there is another planet which is opposite one of the trined planets and sextile ( 60 degrees ) the other two. In Chaney’s chart, Mercury performs this function being opposite Uranus. The opposition in the Kite formation creates a challenge for the person which forces them to find ways of overcoming its tensions by utilising the innate skills of the Grand Trine. Mercury is at the end of Pisces, in the sign of its detriment. Mercury, the planet of communication does not work well here, its as if all its natural methods are taken away. Pisces often creates a certain amount of confusion but it is also a highly resourceful sign that has great skills in unexpected and unusual directions. Mercury is opposite Uranus which indicates that Chaney was forced to look in unconventional and original ( Uranus ) directions to communicate with others ( Mercury ). Hence he had to develop his more physical means of communicating which in the end would bring him a stellar career. It may be without the challenge of communicating with his parents, he would not have gone on to become such a big star. Because it is in the Grand Trine and part of the opposition, there is a very strong emphasis on Uranus. This unconventional planet is in the 5th house of creativity and stage performance. The Ascendant in the chart is about the image that we present to the world and in an actors chart it can say a lot about the kind of roles that they play. Chaney’s Ascendant is part of a powerful Saturn / Neptune / Pluto conjunction which perfectly describes the afflicted ( Saturn ), suffering ( Neptune ) and grotesque ( Pluto ) characters that he is identified with. The aspect of this conjunction that is the most important thing for Chaney to express is Neptune as it is exactly conjunct his Ascendant. Neptune is above all the symbol of compassion for those more unfortunate than oneself. This was essentially why Chaney took on these bizarre roles. He sought to elicit a degree of sympathy and pathos among viewers for his characters who had been the disfigured by fate. The perfect expression of an actor’s Neptune rising. The one role that the Neptune / Saturn / Pluto / Ascendant really points to is his most famous, The Phantom of the Opera. The conjunction occurs in Taurus the sign most associated with singing. Neptune is the planet of ghosts and spectral figures. So the Phantom of the opera is Neptune rising in Taurus. The terrible disfigurement and sadness is supplied by Saturn and Pluto. That Chaney was born to play the part is clear when we look at the chart of the writer of the novel, Gaston Leroux. Leroux was a French author of detective fiction but was best known for The Phantom of the Opera. Astrology is so beautifully simple. Leroux has the Sun closely conjunct Pluto opposite the Moon, an exceptionally strong symbol for detective fiction writing, but the fact that the Sun is in Taurus ( singing ) and the Moon is in Scorpio ( scary figures operating in the darkness ) in the 5th house ( on stage ) just blows you away. 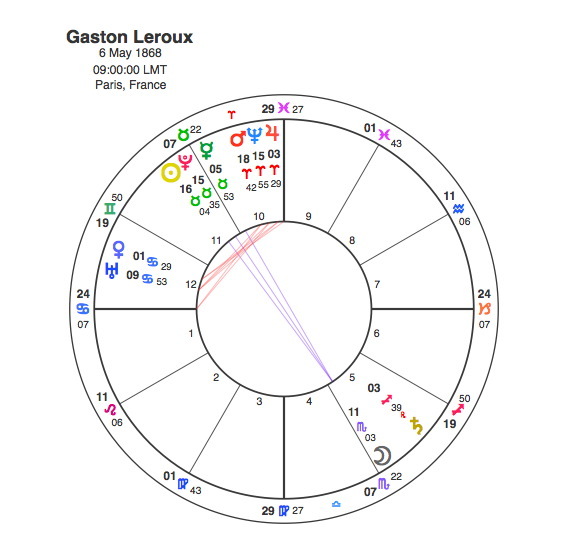 When we add the fact that Chaney’s Neptune / Ascendant conjunction is exactly conjunct Leroux’s Sun we need say no more. How can anyone doubt the simple perfect truth of astrology ? They must just not be fully acquainted with the facts. As Pluto is conjunct Chaney’s Ascendant, it would only make two significant aspects in his life. The first and the critical watershed was the square aspect to his Sun between 1922 and 1925. The Hunchback was made in 1923 and the Phantom in 1925. The other was in 1930 when Pluto was opposite Chaney’s Moon. He died in 1930 of a throat haemorrhage. Taurus, the sign of his Ascendant with the critical Neptune / Saturn / Pluto conjunction, rules the throat. Chaney’s real role in life was to portray unfortunate and disfigured victims in a way that would gain sympathy and compassion. His Neptune rising as part of a Grand Trine along with Mercury in the compassionate Pisces showed his powerful drive to express this and also his incredible skills in doing it. The greatest actors are the ones that totally lose themselves in their part, again a sign of a dominant Neptune rising. Lon Chaney was the Phantom of the Opera. Can we take ascendant as a part of the Kite formation?